"The charismatic movement, once considered a splinter group on the fringe of Christianity, has gained steam and entered the ‘90s at full speed. Dramatic new accounts of bizarre, supernatural events are attracting men and women hungry for religious experiences while causing others simply to ask, What is really happening here?, or more important, What should I believe? This 13-message album thoughtfully and carefully shines the light of Scripture on teaching that is gaining a massive and loyal television following, leading to disunity on a world-wide scale, and promising to fuel controversy for years to come. 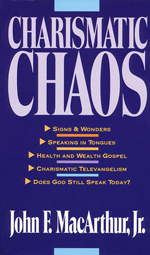 Recorded by John MacArthur, these messages will help you gain an understanding of his bestseller Charismatic Chaos in a short amount of time."